I have a pre-made document and I want to remove a line (same length, same stroke, same color) from every page. Is there a quick way to do this aside from deleting manually? You can use Find / Change to search for objects and automatically change their attributes, but I don't know of a way to delete the objects in the same step. Perhaps you could change the strokes to have both a Fill and Stroke color of None, thus making them disappear. Something like that. Edit: since this was helpful, I added a screen shot. You can either click Find and go through each object individually, or click Change All and the attributes of all objects of the defined type will be changed. Not the answer you're looking for? Browse other questions tagged adobe-indesign page-layout indesign-scripting or ask your own question. How to still keep the automatic InDesign page shuffling while starting a new section on the left or right side? How can I automatically number the survey questions in my InDesign document? Is it possible to remove page margins in Indesign, or make the margins apply to a spread as if it were a single page? Can I Copy an InDesign page along with the master page? 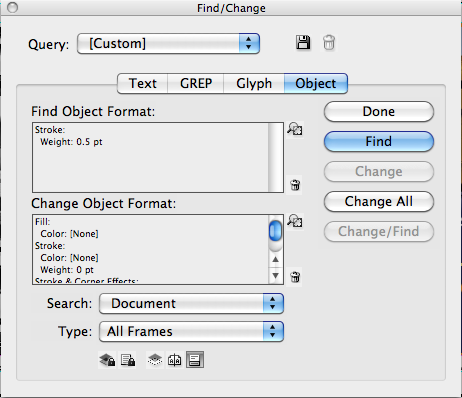 How do you add multiple pages throughout an InDesign file? How to set the same space in between frames in a whole Indesign document?